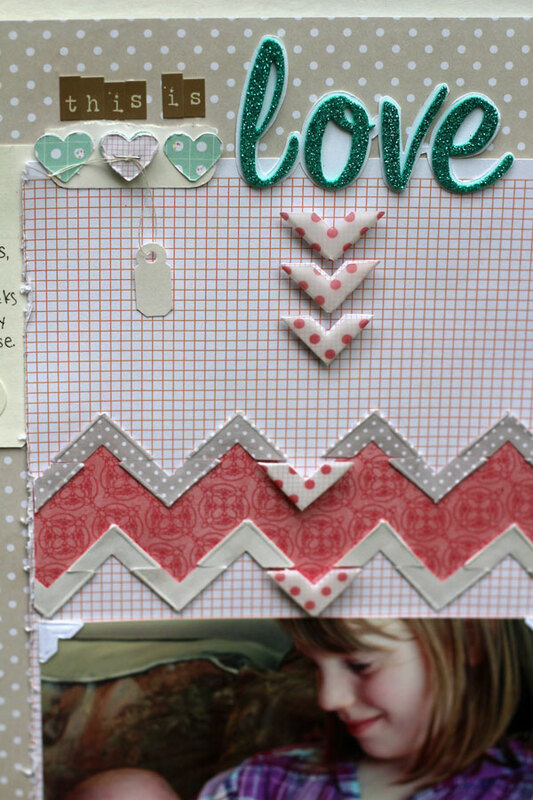 For the chevron challenge at 2Peas on NSD I used photo corners to make a chevron pattern. I used chevrons in a contrasting paper pattern to direct from the title to the photo, at the point where Addie Blue's gaze looks to Lady Bon-bon. All of the papers here are from the Dear Lizzy Neapolitan line from American Crafts. I used both the 12x12 sheets and pieces from the 6x6 pads. I love using the same pattern in both scales on the same page, like I did here with the grey dot (for the background paper) and the small dot (for one of the chevron stripes). I love backing Thickers with solid white cardstock when they need some extra definition on the page. Without the cardstock, they sort of got lost and the title was difficult to read. The tiny Mason jar was cut from the 6*6 pad of Dear Lizzy paper, and the tag is also from the Dear Lizzy collection. 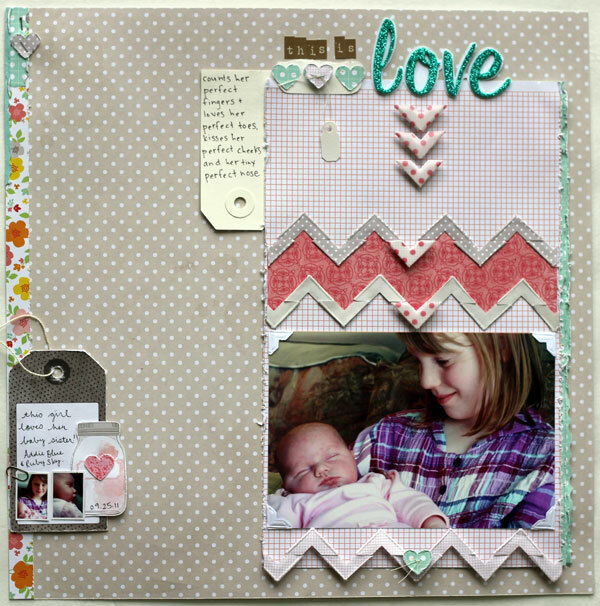 The pretty floral border is a cut-off strip from a piece of Dear Lizzy paper. Supplies: patterned paper (American Crafts); vellum (American Crafts); tags (American Crafts, Avery, the Paper Studio); letter stickers (American Crafts, Prima); punches (Martha Stewart, Recollections); stickles (Tim Holtz); paper clip (Tim Holtz); pen (Sakura); tiny attacher (Tim Holtz).